The RoboSlam robot is built in three stages. Each stage involves some circuit construction and programming to add a new feature to the robot. In this stage, we build a very simple breadboard circuit and then copy a short example program onto the microcontroller to blink an LED on and off. This is the breadboard. We use it to build electronic circuits quickly without any soldering. Each of the two main sections in the centre of the breadboard consists of many short rows of five connected holes. To connect two wires or components together, just plug them into the same short row. For example, wires plugged into holes a3 and e3 will become electrically connected because they are both in the same short row. The long red and blue lines on each side of the breadboard indicate that each of these long rows of holes is connected continuously along the full length of the board. We call these long rows “rails” and they are normally used to supply voltage to different parts of the circuit. The red rail is used for the positive supply voltage (6V in this circuit). The blue rail is normally used for the negative supply voltage (0V). If there are batteries in your battery pack, remove at least one of them and don’t put it back until the circuit is ready to be powered up. Connect the battery pack to the breadboard as shown below. The “brain” of the robot is the MSP430 microcontroller. A microcontroller is an entire computer on a single chip. It contains a microprocessor, RAM memory, flash memory (like in a USB memory stick) and other useful features. 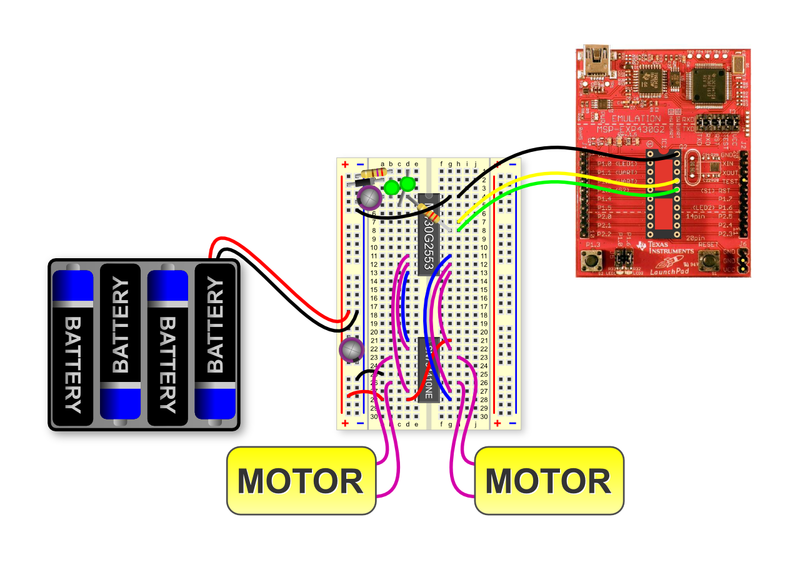 Place the MSP430G2553 microcontroller in the position shown. Make sure that the end of the chip with the semi-circular indentation is in row 4. To prevent the microcontroller from accidentally resetting while the robot is running, a 22kΩ resistor (colour code: red, red, orange, gold) must be placed in the position shown below (between d4 and g8). It doesn’t matter which way around it is inserted. Connect a diode between the red rail on the left and hole a2. The diode is a small black cylidrical component with a silver band at one end and two metal legs. The end with the silver band must be connected to hole a2. Connect a green LED between hole b2 and hole b4. The LED is ever so slightly flattened on one side of its plastic body. This side is the cathode (minus leg) and must be connected to hole b4. Connect a black wire between the left-hand blue rail (0V) and hole 4g. Connect a capacitor between the left-hand blue rail and hole a4. The capacitor is the small cylindrical component with two parallel legs sticking out the bottom. Note that the minus leg of the capacitor, which is marked by a long black stripe running down the body of the capacitor, must be connected to the blue rail (0V). Connect a green LED between holes c5 and d1. The slight flattening on one side of the LED should be on the side that is connected to hole d1. Connect the 270Ω resistor (colour code: red, violet, brown, gold) between the blue rail (0V) and hole b1. The LaunchPad is the red circuit board shown below. It is used to transfer the programs you write from the PC to the microcontroller. Connect it to the breadboard using the black, yellow and green wires as shown below. It’s time to compile the first program for your microcontroller. Programming note for Mac users: This blog asssumes that you are using a Windows PC to program the MSP430. The Mac equivalent of the three MSP430 example programs used in the workshop are contained in this PDF, which was created by Jim Blair from Kinsale Coder Dojo. Double click the file “build_for_g2553.bat” to compile the blinking LED example and copy it onto the microcontroller, where it should start running immediately, causing the LED to blink on and off! Challenge: Change the blinking rate of the LED so that it’s on for 100ms and off for 900ms. Add the SN754410NE driver chip to the breadboard as shown below. The end of the chip with the semi-circuitar indentation must be in row 21. A red wire between the left-hand red rail (6V) and hole a28. A black wire between the left-hand blue rail (0V) and hole a25. A red wire between holes d28 and g21. Add a 220uF capacitor between the left-hand red (6V) and blue (0V) rails as shown below. Note that the negative leg of the capacitor, which is marked by the long black stripe down the side of its cylindrical body, must be connected to the blue rail (0V). A purple wire between holes 11d and 27d. A purple wire between holes 12d and 22d. A blue wire between holes 13d and 21d. A blue wire between holes 11g and 28g. A purple wire between holes 12g and 27g. A purple wire between holes 13g and 22g. // resistor on digital input P1.6. Add the rangefinder to the breadboard in the position shown (holes 14j, 15j, 16j and 17j). Connect a red wire from the left-hand red rail (6V) to hole 17h. Connect a black wire from the left-hand blue rail (0V) to hole 14h. Connect a diode between holes 15i and 10h. The end of the diode marked with a silver band must be connected to hole 15i. Connect a blue wire between holes 9h and 16i. // is distance greater than 500mm?